Christmas Baubles Sets and Patterns! I was planning to upload this earlier but was busy so it got postponed. It's finally online though! The Christmas Baubles set in fuchsia and also one in blue! Featuring a couple of new patterns. To easily install the patterns, use the TS3 Install Helper Monkey from ModTheSims. 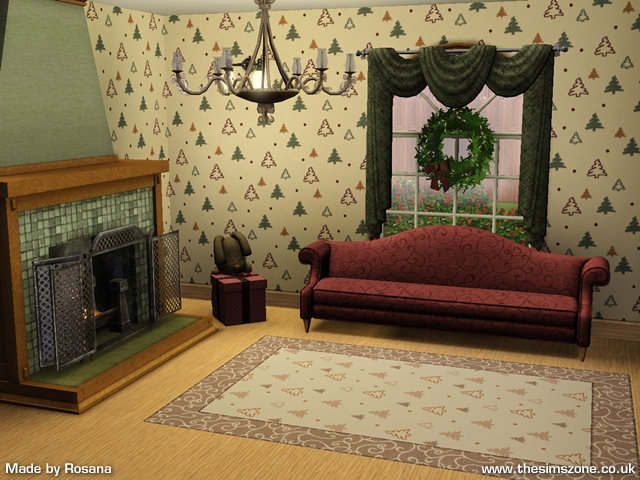 Yesterday I uploaded a new set for Christmas, including a new pattern, on The Sims Zone. Click on the image to view and download the set! We have exciting news coming out of The Sims Studio! The Sims made history with a two-page feature in the coveted People Magazine special year-end issue which is their best-seller each year (2 million+ copies sold). Available on newsstands now, the editorial feature highlights pop culture trends over the last decade from Reality TV and Tweens to Party Girls and Celebrity Babies. The Tween section features a “Simified” illustration of the hottest celebrities from popular brands such as Twilight, Harry Potter, and High School Musical. The hot new band Matt and Kim perform their hit single "Daylight" in Simlish. Prepare to mold the Sims community in your own image. IGN previews The Sims 3 Create a World Tool-Beta. The Sims 3 Create a World Tool - Beta is now available! Create and share new and unique worlds with The Sims 3 Create a World Tool - Beta. Have you checked out The Sims 3 Store yet? Have you checked out The Sims 3 Store yet? Watch The Sims 3 Store trailer to learn more about the EXCLUSIVE items available only at The Sims 3 Store. Get your Sims' into the Holiday spirit with these FREE Happy Holiday Presents for The Sims 3!